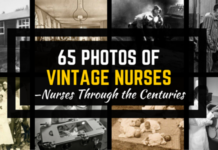 Have you ever wondered what vintage medical equipment nurses used in the past? The world of medicine is rapidly as science and technology continues to accelerate forward. 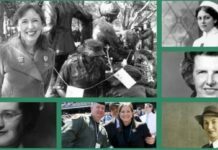 A standard medical equipment nurses use for patient care can quickly become obsolete with new research and technological advancements in the healthcare field. As we practice the nursing profession in these modern times, have you ever wondered how early medical equipment looked like? 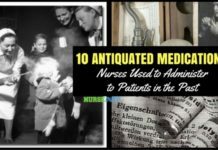 Take a look at the following old medical equipment nurses used back in the 1900s. Willem Kolff was a physician practicing in Groningen, The Netherlands during World War I. In 1943, he made an artificial kidney machine out of wood, scraps of metal and sausage casing. It looked like a rotating drum lined with sausage casings. He used it in treating renal failure patients but he only achieved success with his 16th patient. His first successful artificial kidney machine patient was a 67 year old woman with acute renal failure due to septicemia. After 11 hours of therapy with his artificial kidney machine, the woman recovered. In 1950, Kolff and his family moved to the United States. He became a notable physician in the field of biomedical engineering. His artificial kidney machine was adapted in Boston which resulted in the Kolff-Brigham Artificial Kidney Machine. 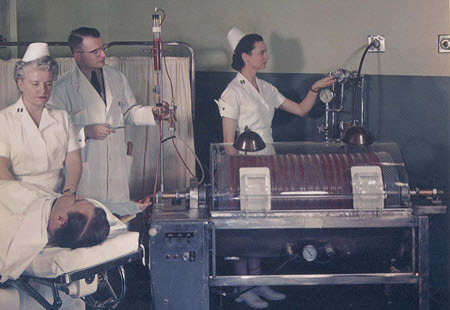 The Kolff-Brigham Artificial Kidney Machine was widely used in the 1950s especially during the Korean War. Nurses during that time assisted doctors in operating the machine as it was quite big and complex to use. Since the Roman times in the 1st century AD, syringes have been used for medical treatment as described in the world-renowned De Medicina book. But, it was only in 1946 when glass syringes were mass-produced for medical use. The Chance Brothers, a company specializing in glassworks, first produced an all-glass syringe with separate interchangeable barrel and plunger. This design allowed for large batches of syringe sterilization without the need to match components. Glass syringes and their corresponding metal needles are quite heavy to use. 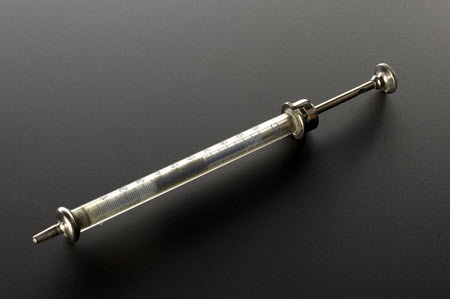 Nurses using these syringes in hospitals often get frightening looks from their patients as they give their medicines. Since glass syringes are reusable, repeated sterilization makes them dull and rusty over time. In 1951, Australian inventor Charles Rothauser developed the first plastic disposable hypodermic syringe. It was mass-produced and replaced glass syringes slowly through the years. The external negative pressure ventilator, or simply known as iron lung, is one of the most popular vintage medical equipment around due to its enormous size and widespread usage in the 1950s. The external negative pressure ventilator has been the subject of scientific studies since the 1600s. However, it was only in 1928 when a prototype was invented and commercially used worldwide. Philip Drinker and Louis Agassiz Shaw, Jr, both professors at Harvard School of Public Health, invented the first iron lung. It is also referred as “Drinker Respirator”. The first iron lung was bulky and heavy. It was powered by electric motors with air pumps similar to vacuum cleaners. The air pumps worked in changing pressure inside the airtight metal box which made breathing instantaneous to patients who have lost respiration control. 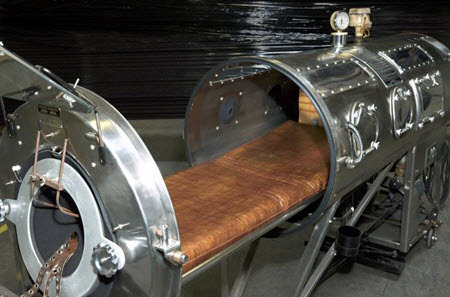 Through the years since 1930s, different variations have been made to the iron lung to make it lighter and less bulky. The iron lung was initially developed to aid in the treatment of patients suffering from coal gas poisoning. But the device was widely used around the world for the treatment of respiratory failure among polio patients when polio outbreaks affected different countries simultaneously. During the height of the polio outbreak, hospitals were swarmed with iron lung machines. Since patients inside the iron lung have limited mobility, nurses assisted them with their daily healthcare needs. The development of positive pressure ventilation through intubation and tracheostomy made the iron lung obsolete in 1980s. Using positive pressure ventilation became more preferable as nurses and other healthcare workers had more mobility in assessing patients than in body-encased iron lung patients. A syrette was widely used during the World War II era. It resembled a superglue tube but functions as a portable syringe. It had a closed flexible tube and the other end had a hollow needle. It usually contained single-dose medicines that could be quickly administered during emergency situations. 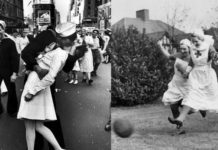 During World War II, syrettes became popular for quick morphine shots. 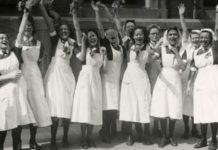 Nurses in the field carried morphine syrettes to be given to injured soldiers. To give a dose, a nurse only had to break the seal and remove the wire loop pin. As the syrette’s needle is injected through subcutaneous route, the nurse would flatten out the tube to give a full dose. Aside from morphine, syrettes were also used for atropine and omnopon doses. 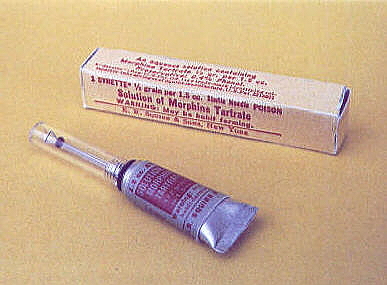 Usage of syrettes became less popular when disposable plastic syringes were developed. Throughout the 18th century, physicians continued to look for ways on how they could accurately measure their patient’s blood pressure. Use of mercury in a glass tube was a trend during that time but it produced inaccurate results. In 1881, Dr. Samuel Siegfried Karl Ritter von Basch invented the first sphygmomanometer. It was made from a calibrated glass tube filled with mercury. In 1896, Dr. Scipioni Riva-Rocci devised an inflatable cuff connected to the sphygmomanometer for easier blood pressure reading. Dr. Harvey Cushing adapted Dr. Riva-Rocci’s design and developed a mercury sphygmomanometer complete with cuff. 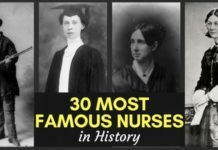 It became popular in the US and nurses were taught how to use it for vital signs monitoring. In 1916, W.A. Baum commercially produced sphygmomanometers for clinic and hospital use. 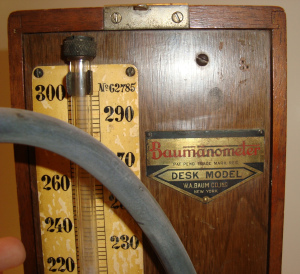 Their model was named Baumanometer and they continuously changed sphygmomanometer models throughout the years. A jet injector is a needleless injecting device that used pressurized air to to penetrate the epidermis with a specified dosage of medicine or vaccine. 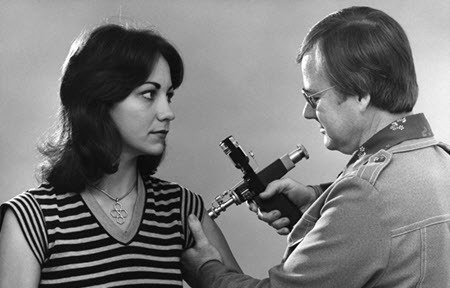 The device was developed in the 1960s for mass immunization of smallpox vaccine. The concept for the jet injector was hatched during the 1900s when frequent engine workshop accidents involved accidental jet injections from fuel injectors. In 1960s, Aaron Ismach invented and patented a medical grade jet injector for mass vaccination. The US government awarded him for his effort and used his invention for mass vaccinations of tne smallpox vaccine in Asia and Africa. The US Department of Defense continued using jet injectors until 1997 when they announced discontinued usage of the device due to growing concerns of cross infection. Since the vaccine or medicine was delivered using pressurized air into the epidermis, skin integrity was compromised. Cross-contamination between applications was highly likely and there had been documented cases of Hepatitis B transmission through jet injectors. 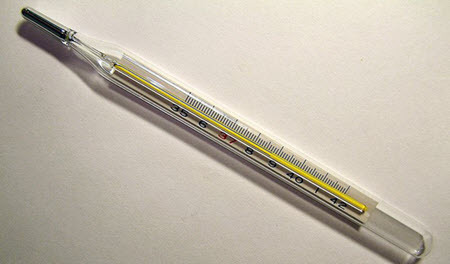 Before the invention of mercury thermometer, water and alcohol were used in the first prototypes of the thermometer. In 1714, Daniel Gabriel Fahrenheit first created a mercury thermometer. Fahrenheit was a physicist, engineer, and a professional glass blower. His mercury thermometer was made from glass calibrated with his own temperature scale. Later on, his temperature scale was adapted worldwide and named after him. During the 19th century, mercury thermometers were big, measuring at least a foot long. It needed at least twenty minutes to accurately measure a person’s body temperature. In 1867, Sir Thomas Clifford Allbutt devised a smaller mercury thermometer measuring six inches long. It only needed five minutes to accurately measure a person’s body temperature. In 1990s, production of mercury thermometers was discontinued. It was no longer recommended for medical use as it was too dangerous to handle. The vigorous swinging needed to reset the mercury level inside the thermometer could lead to accidental breakage resulting in poisonous mercury exposure. 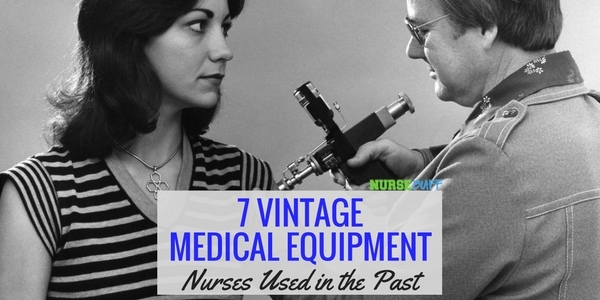 It’s amazing to see that these vintage medical equipment were routinely used by nurses in the early times. Who knows, the medical equipment we use nowadays may soon become obsolete and vintage in the eyes of future nurses someday.